Papua New Guinea Finance Minister and Leader of Government Business James Marape has become the first senior cabinet minister in the Peter O’Neill-led Government to resign from office. He said O’Neill no longer had trust in him and he felt he had to move on. Marape, the Member for Tari-Pori, who had been a loyal cabinet minister, told a news conference at his Vulupindi Haus office at Waigani yesterday that he wanted to spend more time in his electorate. But he remained with the Government and was still a member of O’Neill’s ruling People’s National Congress Party. “This is a surprise to me but I felt that sometimes this sort of thing needs to be made. There had been inferences in the social media and everywhere that I had been sacked and sidelined and all these sorts of things. I just felt that instability for this government is not proper and if some of us are the cause of instability for the Prime Minister to function properly then he needs to get some of us, who he feels are not trustworthy, out,” Marape said. “Prime Minister is running this government and his Cabinet, he is better off running the country his way than some of us, we offer policy advises, we offer advises how we feel where issues of the country needs to be addressed but he disregards many of our advises in most instances so some of us must make way so that he can find other candidates who are compatible to his way of thinking,” Marape said. “I thank Prime Minister O’Neill for the opportunity to serve in his Cabinet and wish him all the very best as he tries to guide our country in such continual hard times, some of which are natural hard times, some are man-made. With this I hereby resign as Minister of State but I look forward to serving the country as a Member of a Parliament,” Marape said. 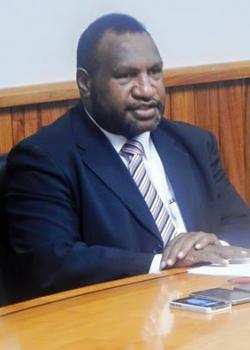 Meanwhile, Prime Minister Peter O’Neill has accepted the verbal resignation of Finance Minister James Marape, saying that “Government wok mas go yet”. He told the Post-Courier last night from Namatanai, New Ireland Province, that he had not heard from Mr Marape and had not received the official resignation letter because he was out of Port Moresby when news reached him. O’Neill, who stayed in Namatanai last night after the launch of the Boluminski Highway when the resignation news reached him, said he would resume the Finance Ministry while an announcement would be made soon after consulting the coalition. “I accept the verbal resignation of James Marape as a Minister of State,” O’Neill said. “He has been a Minister since he was first elected as a Member of Parliament. This commitment has presented challenges at the district level and he has not spent enough time with his electorate and on issues that are close to his people. “We are all elected as local Members first and foremost, and our districts and provinces require great attention for us to ensure improving levels of service delivery. “I have not heard from the Minister today, as a matter of protocol, I expect he will be in contact soon to convey his intentions. “While his resignation is unfortunate, Government wok mas go yet,” he ended with Tok-Pisin.